Why isn’t my hot tub set at 98 degrees where I set it? It’s nearly 104 degrees!! We get this question a lot this time of year. Unfortunately, the ambient air temperature combined with running pumps (which generate heat), will raise the water temperature. The water temperature is going to be hotter than you set the thermostat because there is no way for the hot tub to keep the temperature where you set it when it’s this hot outside. Hot Tubs are made to be hot, so with that being said, they are made to hold in the heat…VERY WELL!! Use the hot tub in the early morning and later in the evening to avoid the summer heat. A lot of people will open the cover in the evening to let cooler air reach the water surface. Maybe remove a cabinet panel or two (for air flow) and run the jets to help cool the water. Adding a roof or pop-up covering is also an option. Also, removing some of your water and topping it off with fresh, cooler water may help. You can also lower the thermostat as much as possible, wo the hot tub heater is not running. 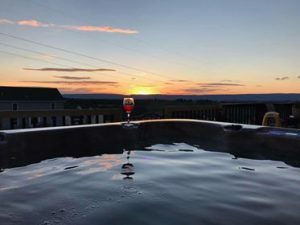 Most new hot tub owners don’t realize that your optional time of year is to use the hot tub is in the spring, fall and winter.